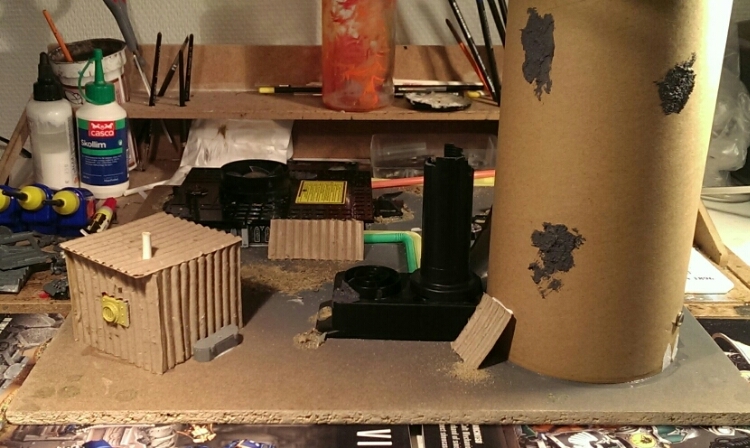 My first completed custom scenery piece is almost built. Take a look. 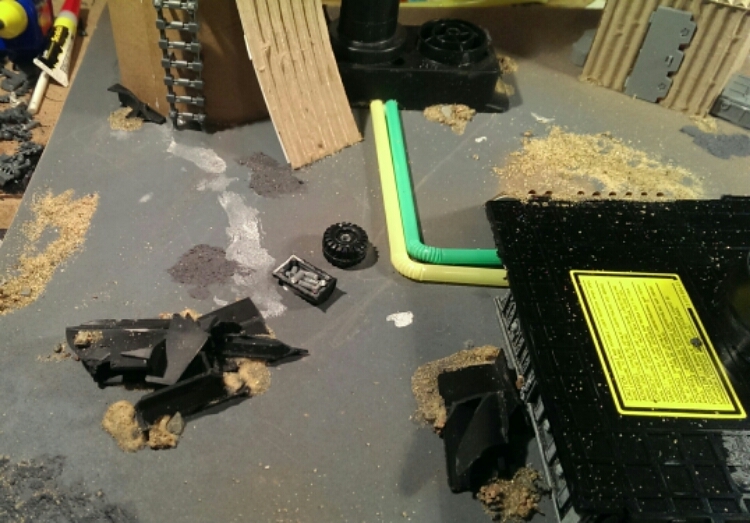 Let me start by directing you to Nickeninjas blog with the most amazing Necromunda terrain I’ve ever seen. I’m so not worthy but here goes! 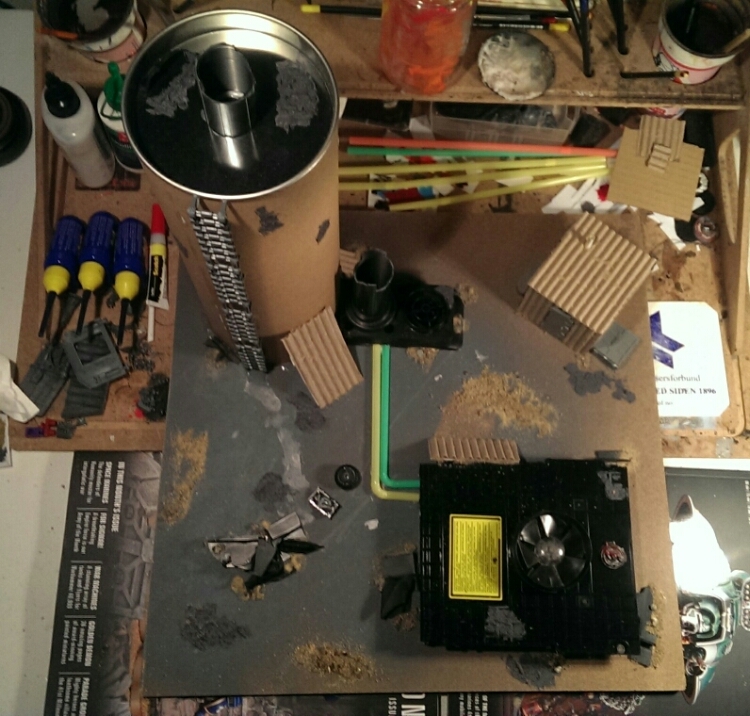 The first custom piece quickly landed on that big cylinder. Having an uncle that is a farmer I immediately thought of silos so I googled industrial silo and I pretty much had my direction set. What you see from the overview is the silo with broken feeder pipe and the generator that’s partly underground. Now the reason I linked Nickeninjas blog is because one of the elements I think really does it on his terrain is because it looks like people are actually living there. 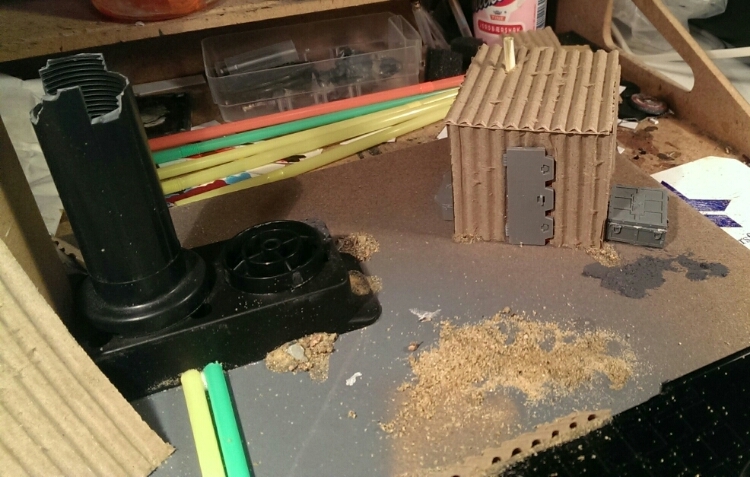 So basically that’s translated into the little fireplace..
…and the hab unit with some crates. A development in the rough background is evolving. I think that this is post Beluga 61 conflict (the one we’re playing as a campaign in my group) and this is with the remaining people in the ruins trying to eke out a living. This part is for surveillance. The silo is obviously the observation point but they rotate and stay warm by the fire or sleep in the hab unit. I’m actually very pleased at the moment as I think this can easily double between skirmish games and 40k. I have a great idea for several more pieces but I’ll finish this one first! Looks great. My one suggestion is to texture the ground a little more, and build up more texture where the structures meet the ground-plane. From my experience, once this gets painted, the flat parts of the board are going to look and feel painfully flat, and not give you the effect you’re looking for. Cheers mate 🙂 yeah I agree, especially since I don’t have an airbrush and can get a gradient effect on flat surfaces. At least not this big. Looking awesome dude! 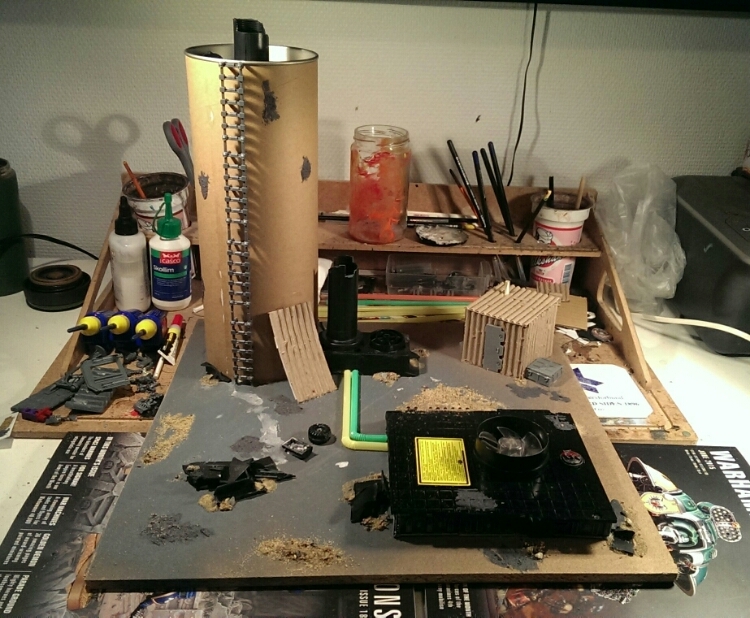 Reminds me of the old “how to make wargames terrain” book! Wow…just awesome! I love it!